BOSTON--(BUSINESS WIRE)--04/20/2004--Why look the same as everyone else on the dance floor? 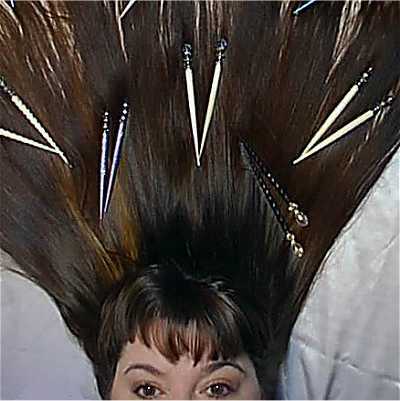 Dellaria offers a trendy new prom idea to make you look unique so your hair stands out as you walk down your "red carpet" at your prom. "This season is all about color, color and color," says Catherine McNeal, executive vice president of Merchandising for Cache, Inc. "Extenuate your hair with gorgeous colorful flowers and glamorous broaches." For a head of playful curls (image 1), Dellaria's Kenmore Square Stylist, Amanda Santos, used a one-inch curling iron for spiral curls all around. -- Slowly finger comb through the defined curls, section by section. This separates the curls without frizz. Redken's "Outshine" gives shine and definition to the curls. -- Finish by using Biogenol "Designer Spray" for hold and Bead Head "Headrush" for shine. For the complete updo look (image 2), section the front part of the hair away and pin it to the side. The remaining hair should be curled with a large rod curling iron and pinned to the top of the head in big, barreled curls, leaving just a few of the ends out. Clothing and accessories provided by Cache, Inc. 2004 Prom Collection. Cache's 2004 Prom Collection offers a variety of silhouettes, fabrics, and price points. Hair styled by Amanda Santos of Dellaria Kenmore Square. Make up by Camilla Zohn of Dellaria Summer Street in Boston. All products and accessories used to provide each look can be purchased at various Dellaria locations. The perfect prom updo can be found at any of Dellaria's twenty-seven locations throughout Massachusetts, Rhode Island, New Hampshire, and Connecticut. Voted by Channel 7 as New England "Best Hair Salon" Dellaria guarantees quality hair services that are fashionable and unique. For more information on Dellaria's trendy prom finds, contact Ellen Pestell at 617-254-1004 ext. 22 or visit the Dellaria website at www.dellaria.com.